This guy isn’t one of them, apparently. When I left Grace Church after choir practice a protest was making its way up Broadway. The protestors were peaceful, and it looked like the focus was Trayvon Martin, but there was also a prominent sign calling for Ray Kelly (the NYPD Police Commissioner) to resign and others about police brutality. He’s talking like this to a middle aged choir lady standing quietly on the sidelines. It was just so bizarre and unnecessary. I always suspect people like this must have been picked on in the playground when they were children. They then spend the rest of their lives trying to prove that no one can ever pick on them again. So to the cop in the picture: I don’t know if you were just having a bad day, or recently lost someone close to you, or maybe someone was a jerk to you at this protest, but if this is any indication of the way you normally behave, you’ve been in the job too long. It’s time to retire. You didn’t act like a cop, you acted like a thug, and today you were an embarrassment to the badge. Worse, your behavior makes it harder for decent cops to do their job. It creates an adversarial relationship between the police and the citizens of New York, which isn’t useful in any situation, and it puts a lot of good cops in line to one day become as bitter and miserable as you. Maybe you just need a vacation, and a therapist. But if you hate us, and your job, retire. The white shirt indicates he’s a supervisor, at least a sergeant (http://en.wikipedia.org/wiki/New_York_City_Police_Department#Ranks_of_the_NYPD). 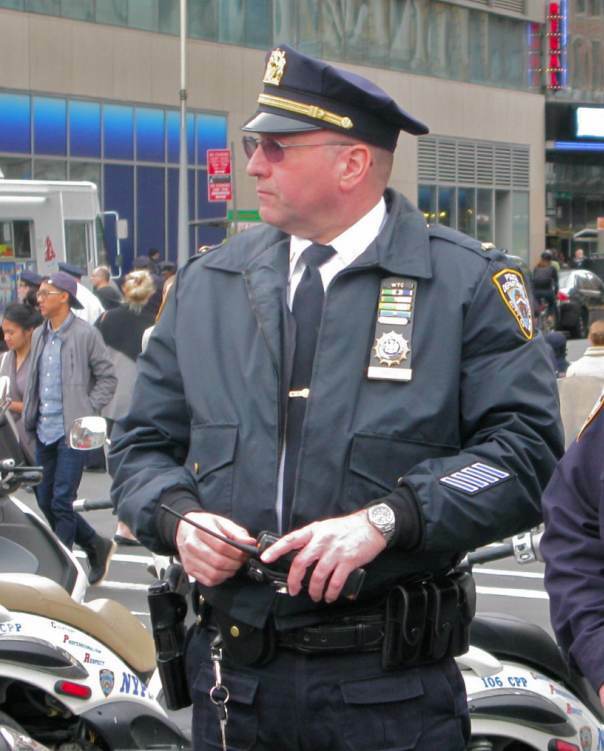 His uniform bar has the “World Trade Center” commendation bar, the blue bar “Commendation for Community Service”, the “Excellent Police Service” bar, and what looks like a unit citation (see http://police-badges.de/hidden/nypd.html). In all, points to a long-timer. He was either having a bad day, or is like that all the time. If the latter, at least you don’t have to deal with him every day; others are probably less fortunate. Yikes. I assume he didn’t see you taking his photo, or you most likely would be “in cuffs”. Well worded post. I think you should send it to the Times. Only you would start a post including a story about a cranky cop with the headline “I’ve known a lot of great cops.” Your ability to always try and see the other person’s point of view, even when they’re being cruel to you, is a credit to you. Let’s just hope he IS retiring soon. I think that guy’s been a school yard bully all his life. Thank you, CR. And the stripes on his arm indicate he has twenty years so he can retire now with a full pension. Vivian, I never thought of that. I always think adult bullies were the ones bullied in childhood, not that they were bullies all along.